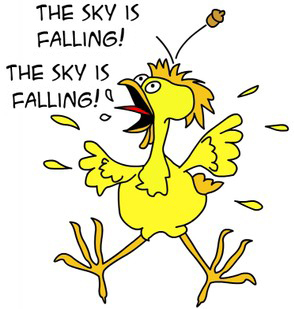 Chicken Little was well-intentioned when he hysterically warned of impending disaster. The only problem was that his predictions were based upon conjecture rather than facts. Back at the turn of the millennium, modern-day Chicken Littles mongered fear over the impending “Y2K” disaster that, of course, never happened. More recently, there has been more than a bit of press about the implementation of the next round of Google search ranking algorithms that will only begin to be rolled out on April 21, 2015. Without doing any research of their own, many self-proclaimed “experts” are citing a Google blog post, a comment reportedly made by a Google employee, and a speculative article that recently appeared in Entrepreneur Magazine as the bases for their warnings of dire consequences for today’s typical website. Like grade school students spreading rumors in the schoolyard, it is time for some people to take a “time out”. Like the news networks that love to exaggerate stories and develop sensationalist headlines like “Stormageddon” and “Blizzard of the Century” (and, of course, the aforementioned “Y2K”), the new buzz word amongst the uninformed is “Mobilegeddon”. People using this type of terminology remind me of those who blindly share urban legends on Facebook, without taking a moment to first check the facts. The stories may generate excitement, but they lack credibility. The fact is that Google will be rolling out a new set of search algorithms starting on April 21st; however, this does NOT mean that a website that is not deemed mobile-friendly will suddenly drop from the results of Google searches made from mobile devices. That is an outright exaggeration. What the new algorithms mean is that sites that are mobile-friendly will have an edge over sites that are not mobile-friendly, being flagged as “mobile friendly” alongside those search results. This rise in the rankings of mobile-friendly sites will come at the expense of sites that are not deemed mobile-friendly, but it does not mean that those latter sites are suddenly going to be dropped from being indexed. Chicken Littles have suggested that half of a site’s traffic is suddenly going to disappear effective April 21st, if the site is not mobile-friendly. This is patently untrue. Using historical Google Analytics data that I have drawn from actual campground websites, let’s presume that 35% of the traffic to a website comes from search engines, and that 50% of that traffic comes from Google, and that 50% of THAT traffic comes from users of mobile devices. Do the math. That would mean that, if a website was totally dropped from mobile search results on Google (which is NOT going to happen at this time), that site would lose approximately 9%of its traffic. That is the reality, rather than conjecture and misguided speculation. There are plenty of valid reasons why every business should be moving to replace a conventional website with a new mobile-friendly site, and to do so sooner rather than later. However, the people who are suggesting panic are doing a tremendous disservice by encouraging the jerking of knees rather than the exercise of a careful plan for execution that includes properly methodical planning and budgeting for the long-term investment in mobile-friendly technology. In years past, many businesses were advised to buy into expensive mobile apps or separate mobile websites, in an attempt to capture the market for users of mobile devices. In retrospect, those dollars were generally not well spent. Today, the dust has settled and responsive website technology has taken its place as the mobile-friendly solution that Google and the other search engines prefer, with one site presenting full content that is optimized for every device. If your site is not currently mobile-friendly, make plans for the transition – as I have said, sooner rather than later. In the meantime, don’t panic. The sky is not falling, and the world is not about to end on April 21st.